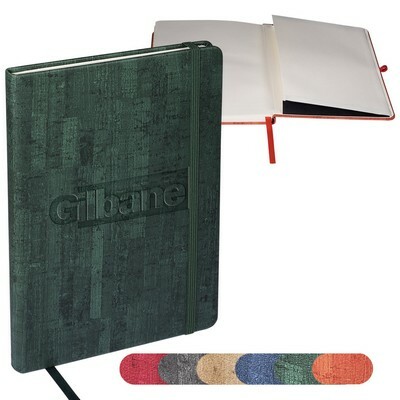 Our Casablanca journal with bookmark has a simulated cork textured cover with natural weathered look . Notes can certainly be taken in any simple journal. But there comes a time when you want to make a best first impression. If you are conducting an induction for your new joiners, organizing a meeting for professionals from different divisions or companies, or having a meeting with a potential client, won’t you look out for a special kind of journal? The Casablanca journal with bookmark has a classy look and amazing features that leave a lasting impression on the user and onlooker alike. Add your brand logo and marketing message on the wide imprint area of the journal; hand them out at upcoming promotional events to promote your brand to a large customer base.